Civil Society has expressed solidarity with Tapan Padhi, a strong supporter of Bhasha Andolan and a sentinel of social justice. Padhi has been subjected to arbitrary arrest and police atrocity. 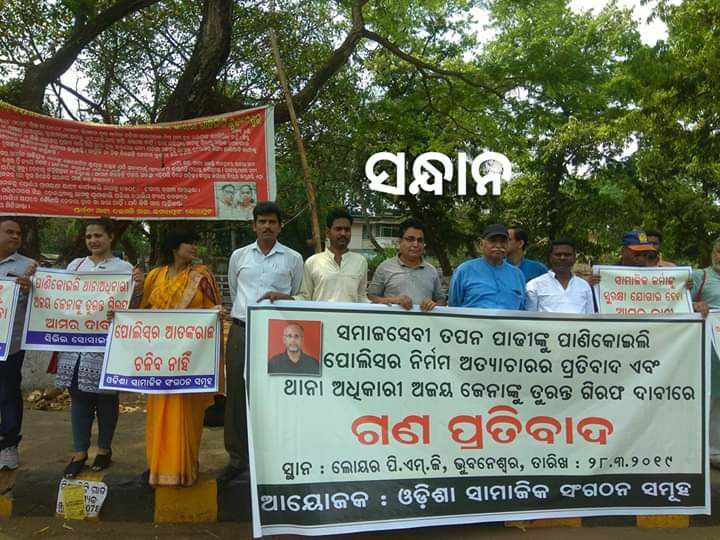 A congregation of eminent social activists who rallied for him at the capital city of Orissa today in the Gandhi Marg has demanded that the false, fabricated, cooked up and misconceived police case against Padhi be forthwith withdrawn and the Police IIC of Panikoili PS be prosecuted against with instant suspension for the condemnable atrocities he has perpetrated on esteemed activist. Eminent environmentalist and Chairman of Lokashakti Abhijan Prafulla Samatray, eminent journalist and founder of Bhasha Andolan Subhas Chandra Pattanayak, President of Orissa Union of Journalists Prasanna Mohanty, State Convener of Right to Information Abhijan Pradeep Pradhan, eminent activist of Human Rights Sri Akhand, Sachikant Pradhan, Pradipta Nayak, Bhajaman Biswal, Ms. Sanjukta Panigrahi, Congress leader Amiya Pandav, leader of Slum dwellers Association Ms. Ranjulata Mohapatra,Pratap Sahu, Roma Dasmohapatra,eminent Human Rights activist Ashok Nanda, Arun Kumar Dihudi, Biswanath Patra, Ranjan Kumar Das, Srikant Pakal, Ashok Dutta, Jitendra Sahu, Prakash Samantasinhar,Pradeep Mohanty, Sujit Sahu, Madhabanand Bhoi, Shantanu Kumar Sahu, Journalist Deepak Mangaraj, S.K.Javed, Ajit Swain, Akshaya Phagun, Pradeep Nayak, Swadin Das, Manas Patnaik, Dillip Samantaray, Bhuban Chand Hati, Anup Parida, Bhimasen Biswal and others participated in the rally. A six member deligate led by Asok Naanda met the Police Chief, who assured to look into the demands of the Civil Society in right earnest.